Supply chain finance (SCF) offers high-quality, low-risk financing to the small merchants that tend to be underserved by traditional lenders. These microentrepreneurs often lack the credit data traditional lenders need and are seen as too costly to serve at scale. SCF leverages data generated by businesses when they buy from suppliers and sell to customers, using this information to evaluate the creditworthiness of small merchants. It is a useful tool to expand financial inclusion for the 141 million microenterprises in developing countries and to promote inclusive economic growth globally. SCF benefits merchants with timely access to credit; it also benefits merchants, suppliers, and fast-moving consumer goods companies (FMCGs) with higher sales, faster turnover, and more efficient operations. Lenders benefit as well: SCF reduces risk and costs, allowing financial service providers (FSPs) to cater to new markets. We believe that platform-based models, those that consolidate data produced by the movement of money and goods in the supply chain, are best suited to deliver SCF. Platform-based SCF models can satisfy the interdependent needs of multiple stakeholders simultaneously and facilitate coordinated decision-making. FSPs and FMCGs are well positioned to develop SCF platforms. This brief discusses how SCF platforms can help small merchants, FMCGs, suppliers, and FSPs realize their economic potential. 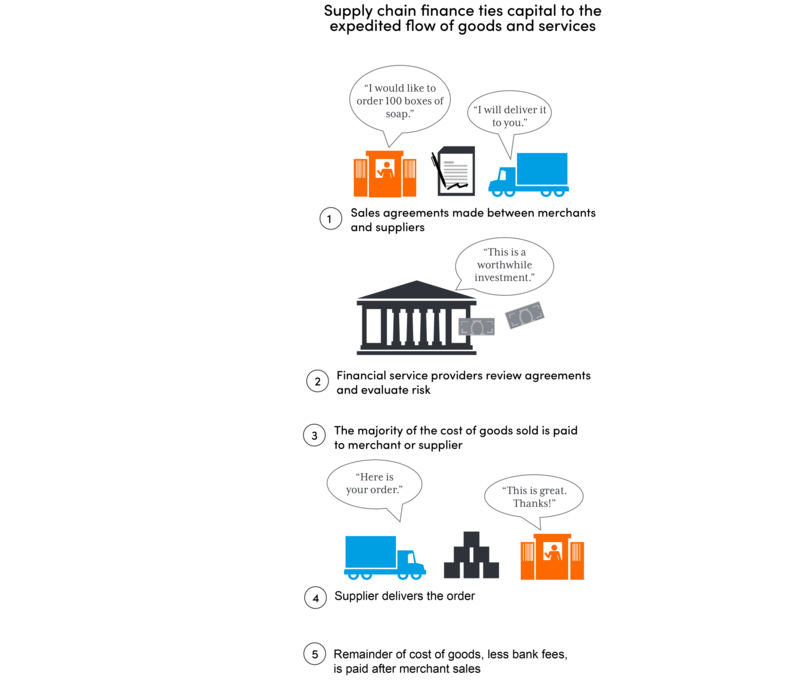 For institutions interested in developing an SCF solution, access our recent in-depth guide and playbook, How digitized supply chain finance can help small merchants grow. Small merchants such as grocery shops, corner stores, and other micro-retailers employ more than half of the world’s labor force and contribute significantly to global GDP. These merchants rely on personal savings, family and friends, and sometimes personal credit to meet cash flow needs, but collectively these businesses face an $8.1 trillion credit gap, creating a significant barrier to inclusive growth. This global credit gap is almost entirely a supply-side problem, as micro, small, and medium entrepreneurs’ (MSMEs’) demand for financing is significant. Serving this market is challenging for lenders. Small merchants have little to no business documentation, are often unable to provide high-quality collateral, operate primarily in cash, and require loan sizes that are not always worth the operational cost of serving them, making it difficult to assess credit risk and sustainably offer products that meet small merchants’ needs. By addressing this problem and helping MSMEs obtain the financing they need when they need it, we help microentrepreneurs restock their shelves, expand operations, and hire more employees. By addressing this credit gap, we can help more people around the world realize their economic potential. Emerging innovative digital lenders are using alternative sources of data to offer a viable solution to address the merchant financing gap. Their models are delivering higher-quality, faster, and more convenient finance to small merchants. These lenders connect with and understand their MSME clients in ways that allow them to better assess risk and manage cost. One way that some new lenders are gaining better insights into this client base is by leveraging the existing relationships between merchants and their suppliers. Inventory suppliers who already know merchants well can provide valuable data, like inventory purchases, goods sold, and payments made, that FSPs can use to quickly assess merchants’ creditworthiness to get them credit when needed. These relationships form the basis of SCF. This new way of assessing MSMEs’ creditworthiness follows on the success of e-commerce platforms like Amazon and Alibaba, which have been providing credit to small merchants for several years and demonstrate the significant market opportunity of creating an SCF solution. Ant Financial and MYBank, both affiliates of Alibaba, have used digital payment transaction data to underwrite more than $70 billion in cumulative loans to 5 million small businesses, microenterprises, and entrepreneurs. This lending market has grown so rapidly due in large part to technological advances like cloud services, new data footprints, and e-invoicing, which allow lenders to quickly and accurately assess merchants’ creditworthiness. SCF leverages commitments in the form of payables and receivables as well as data generated by the movement of goods along the supply chain to provide merchants with just-in-time credit. Lenders use SCF to finance inventory purchases, alleviating the financial bottlenecks that occur due to the delay between the acquisition of inventory and its sale. This reduces risks for the lender because they know exactly how the credit is being used. To enable SCF, it is important to have an integrated approach with four key actors: the merchant, the FMCG company, their supplier, and the FSP. Each of these plays a critical role in exchanging inventory management and financial transaction data that can be used to underwrite financing for the merchant. Platform models (such as Amazon, Alibaba and others) have created the digital infrastructure that enables all participants to interact with each other; these models are particularly well-suited to provide SCF services, as they facilitate the sharing of timely information and coordinated decision-making that enables merchant financing and ultimately closes the MSME financing gap. Several innovative lenders are already using platform models to identify, assess, serve, and support small merchants, including Jaza Duka, Sokowatch, and Tienda Pago. While all of these are providing SCF, they use different strategies: each relies on different types of partnerships, varying degrees of mobile tech, and their proprietary algorithms for credit scoring. Each of these solutions free merchants from the constraint of needing cash on hand to purchase inventory, which ultimately allows them to sell more and increase their revenue over time. Jaza Duka, Sokowatch, and Tienda Pago are making strides as viable alternatives to the traditional lenders that have been unable to cater to small businesses cost-effectively. Their success has helped MSMEs benefit from the formal financial sector. Jaza Duka is currently a partnership between Unilever, Kenya Commercial Bank (KCB), and Mastercard. The platform tracks how much Unilever product a store owner has purchased over time and combines that data with a credit analysis by Mastercard; KCB then receives that score and can use it to provide an interest-free credit line for the merchant to buy more Unilever products. Sokowatch aims to provide informal retailers with the power of e-commerce through mobile ordering of goods. By aggregating merchants’ demand for FMCG products, Sokowatch increases suppliers’ efficiency when fulfilling merchants’ orders. By leveraging historic purchasing data, the company provides merchants in Kenya and Tanzania with a ‘pay later’ option to keep products they want in stock. Merchants order goods using a mobile phone-based inventory management system and receive same-day deliveries from Sokowatch drivers. Tienda Pago leverages relationships between FMCGs and small merchants across Peru and Mexico to inform its vetting process. It applies a proprietary screening algorithm across transaction and supply chain data to generate a credit score for each MSME retailer. Their mobile-based platform model not only helps close a funding gap for small stores but also enables distributors to increase their operational efficiency by reducing cash handling. FMCGs benefit from SCF through greater sales, since merchants can use financing to place larger orders. They also benefit from increased visibility into merchants’ sales, inventory levels, and demand at the end of the supply chain when an inventory ordering system is used. This information enables more accurate demand forecasting and more efficient distribution of goods. SCF also offers an attractive proposition to the suppliers that deliver to merchants. When merchants purchase greater quantities of inventory, it ultimately increases suppliers’ sales. While suppliers may offer merchants credit themselves, this is not part of their core business, and they face significant risk in collecting cash and managing delinquency. Usually, suppliers are more than willing to pass on the provision of credit to another party. Ultimately, being part of an SCF solution will free up a supplier’s working capital for investment. Given that so much of the world’s economic and trade activity is driven by small merchants, an SCF solution that brings down the cost of financing and meets their needs will help promote sustained, inclusive, and sustainable economic growth. Unlike direct lending, SCF demands effective collaboration and data sharing among multiple actors to ensure the sustainability and scalability of the solution. Suppliers must maintain close relationships with small merchants to understand merchants’ ability to sell. Small merchants need to offer proof of purchase and inventory demand so FSPs can conduct underwriting and approve the SCF credit. The success of the arrangement also hinges on the FSP’s relationship with the supplier, as the supplier will provide the FSPs with the merchant’s purchase and repayment history. When all parties work together collaboratively, the result is an integrated approach that drives adoption and usage of financial services, and therefore meaningful financial inclusion. The success of an SCF solution is largely dependent on whether the product is easy to use, affordable, and accessible to merchants. SCF providers will need to ensure that they build trust with merchants and meet them where they are, clearly explaining the product in a way that addresses any new requirements expected of the merchant. To encourage the active usage of an SCF product, it should include suppliers of high-demand goods that are hard to substitute (such as the top local brands) and a growing catalog of products available to order. Strong FMCG product champions based on the ground, loyalty rewards, and discounts can help promote the solution. Value-add services, such as business education, financial tools, or supplemental financial products that can be tailored to merchant needs will also help incentivize continued use and ensure that an SCF solution is valuable to the merchant. Building a fully-operational and interoperable SCF platform will take time, but the key first steps are to strengthen internal knowledge and initial relationships for a successful SCF offering that can later open up platform possibilities. Any actor in the supply chain can lead the development of a platform-based SCF solution; however, FSPs and FMCGs are particularly well positioned to do so. Regardless of who takes a lead in developing an SCF platform, it is important to align incentives for all actors to take part in the supply chain solution. FSPs have an incentive to lead, as SCF creates an opportunity to reach a new segment with a new product line. Since FSPs are not involved in the movement of goods within the supply chain and are only involved in providing financing to the merchant, they are also well-positioned to play the impartial role needed to aggregate competing FMCGs, suppliers, and merchants. Begin building a network: Build relationships with influential supply chain actors. This could be done by taking on any debt owed to suppliers from merchants in exchange for knowledge of the distribution network. Build a risk model: Leverage relationships with influential supply chain actors to vet initial financing candidates, and use the data collected to further build the credit methodology. Consider disbursement, repayment, and collections: Assess payment network options available for repayment, and assess value to suppliers for performing collections on their behalf. Begin building a network: Implement an inventory management system that is flexible enough to enable delivery drivers to record sales and delivery transactions. Partner with an FSP for a credit product: Build a relationship with an FSP that can develop a risk model based on delivery receipts or invoices, and link the inventory management system with the FSP systems. Consider disbursement, repayment, and collections: Assess payment network options available for repayment, and work with the FSP to enable digital disbursement of funds. Regardless of which actor takes the lead, it is important to get ‘the equation right’ between merchants and others along the supply chain in order to create a scalable and inclusive solution. Each merchant has unique needs, and understanding these needs is essential for the design, launch, and optimization of an SCF platform. As more FMCGs, suppliers, FSPs, and merchants participate on the platform, the network effect will take hold, increasing the amount of available data that the scoring model can use to assess creditworthiness and improving the value to the merchant through greater diversity of goods and competitive pricing. While competitors may be hesitant to participate in a joint solution, there are benefits to cooperate in a platform, such as aggregating small merchant demand that may be too disbursed and costly for any one actor to undertake themselves. To scale, an SCF solution must also manage the costs related to onboarding merchants; however, suppliers’ distribution networks should offset those costs. Likewise, managing default risk is a key competency requiring effective partnerships with FSPs. Finally, customer delinquency and retention has been a challenge for existing SCF solutions, as many customers do not fully understand or trust new digital products. This has led to poor repayment rates and high percentages of inactive clients. Making SCF work for merchants requires a well-designed and clearly articulated value proposition. Ultimately, an SCF platform solution can collect formal digital sales records, track demand, and provide small merchants with the credit they need to keep their shelves stocked and grow their businesses. For the merchant, stable inventory levels and fewer instances of out-of-stock inventory will increase their reliability in the eyes of their end-customer. SCF can be a useful tool to close the credit gap faced by small merchants. It can help many FSPs reach new or expanded customer segments with high-quality, low-risk financial services. With nearly 141 million microenterprises in developing countries, digitized SCF represents a scalable solution to drive inclusive growth throughout the world. To learn more about SCF platforms, read Accion’s Global Advisory Solutions recent in-depth guide, which illustrates the enormous potential that digitized SCF offers to small merchants. The guide articulates the advantages that FSPs, FMCGs, and their suppliers in emerging markets can expect when joining and participating in an integrated, more inclusive financial system. It also offers a ‘playbook’ for how an organization could get started, expanding on the critical first steps and key considerations outlined here. 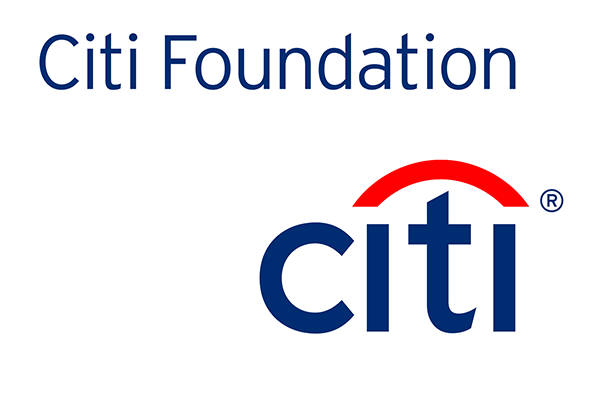 We partner with financial service providers around the globe to better meet the needs of underserved individuals & small businesses.